4 Star Review from RT!! The first review for A Perfect Distraction is in! RT Book Reviews has given Jake and Maggie 4 stars! This entry was posted in News and tagged A Perfect Distraction, Harlequin Super Romance, RT book reviews on July 27, 2013 by annasudgen. As loyal New Jersey Devils fans and season ticket holders, we attended around 30+ games a season; more if you included the post-season. You’d think we’d have known as much as there was to know about our home arena. 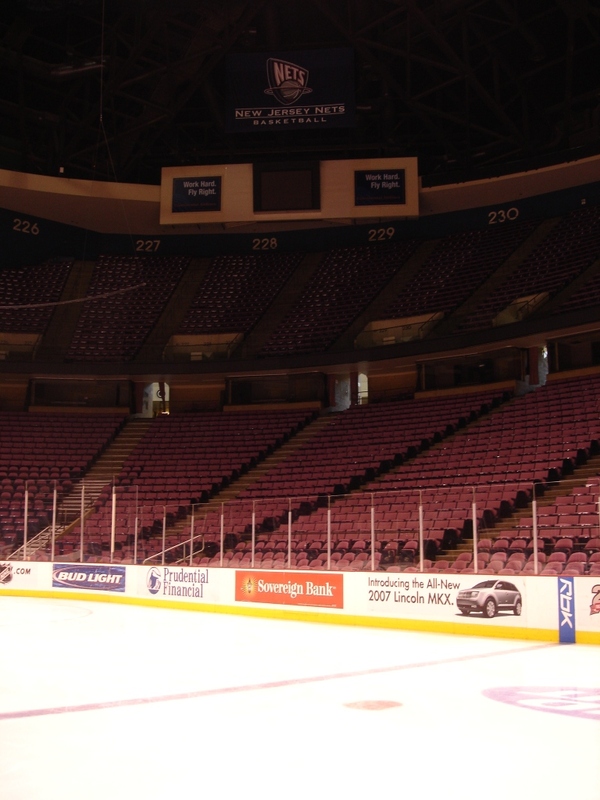 What the fan sees is only part of the story, as I found out when I visited the Continental Airlines Arena, at the Meadowlands, in New Jersey. VP of Arena Operations, Tom Ferreri was kind enough to give up some time on a busy game day to show me around behind the scenes. Aside from having an encyclopaedic knowledge of the workings of the arena and everything in it, Tom has a fantastic ability to make the most technical information accessible. His enthusiasm for his work and for the arena shines through. And if you ever get a chance to see a fantastic video of Tom’s team changing over from a Devils game in the afternoon to a Nets game in the evening – awesome. As someone who was there, watching the Devils play the Detroit Red Wings and leaving mid-afternoon, I was amazed that the arena could be ready for the Nets game that evening … but it was! Thanks to Tom, I got a very different perspective on the arena. A player’s perspective – perfect for adding colour to my book. Aside from some pretty cool facts – did you know the ice is less than two inches thick?! – I was able to get a real feel for the sights, sounds and smells of where the players play. The overwhelming smell in the arena, early on game day, when both teams are running through their practices, is of popcorn. As you go closer to the dressing rooms, you can hear the grinding and sanding of sticks and smell the acrid aroma of glue and tape and heated acrylic. Half-dressed players wander past – that was tough ;). Some are bigger than you expect, even without all the padding. Others are surprisingly small. They all look very different without their helmets. And without their sweaters (aka hockey jerseys)! Assuming they stay healthy, these guys play 82 games a season – more, if they make the post-season. Often, they play two to three games a week. Occasionally, they play back-to-back games, on consecutive nights. And they travel – especially out West. In between that, they practice and train. Let me tell you, these guys work bloody hard and are unbelievably fit. Even at a morning skate, they’re giving it their all. They are also the most down-to-earth guys you’ll meet. Even the big stars are surprisingly humble and totally charming. As a Brit, and football (soccer) fan, it did my heart proud to hear tales of the players knocking around a football as a way to chill out before the game. Back to interesting perceptions. Let’s start with the ‘tunnel’. As a fan watching from my seat, when the lights go down, the intro music swells and my boys come out of the locker room and onto the ice, it looks like they are emerging from a tunnel. But, it’s not a tunnel at all. It’s a low archway. Who’d have known? Then stepping out onto the ice itself was astonishing. Suddenly, all the noise from the arena is deadened. It’s like being in a sound-proofed booth. Then, Tom clicked his fingers and the sound echoed. 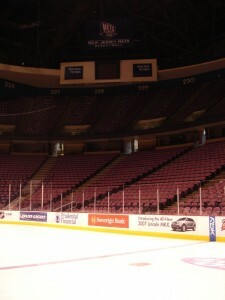 It’s a deliberate acoustic set-up to enable the players to communicate on the ice – regardless of whatever is happening in the arena. Next it was up to the halo, the top-most ring of the arena, where the scratched and injured players watch the game alongside the statisticians. That’s also where the replay booth is, with connections down to the truck for film of the play and phone lines to both the NHL offices in Toronto and the officials at ice level. Back down in the arena’s lower levels, I was able to have a quick peek in the Devils’ locker room – which was a lot smaller than I thought it would be. And a lot smellier too! The hustle and bustle of pre-game preparation is impressive. Not least with the careful ministrations of Zamboni drivers Jimmy and Bobby ensuring that the ice surface is the best it can be for game time, as well as looking after it between periods. 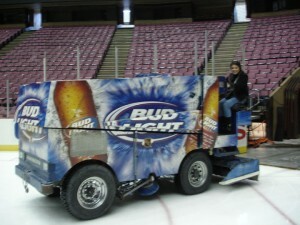 Many thanks to Tom and Bobby for allowing me to ride on the Zamboni! Also busy are the commentators and media folk. On my trip, I met hockey expert Stan ‘The Maven’ Fischler, radio commentator Matt Loughlin and TV front man Steve Cangialosi. Though we often see them at games, it was good to chat with the best TV commentator in hockey, Emmy award-winning Mike ‘Doc’ Emrick and fan favourite colour commentator, former goaltender Glenn ‘Chico’ Resch. The technical guys, in the truck and in the arena, were very helpful too – showing me how things worked and what went into showing a game; all the camera angles as well as how they replayed snippets and how information was sent up to the booth for replays. It was a wonderful day! As well as giving me a wealth of information, it was a lot of fun. I can’t thank Tom Ferreri enough for all his help and expertise. 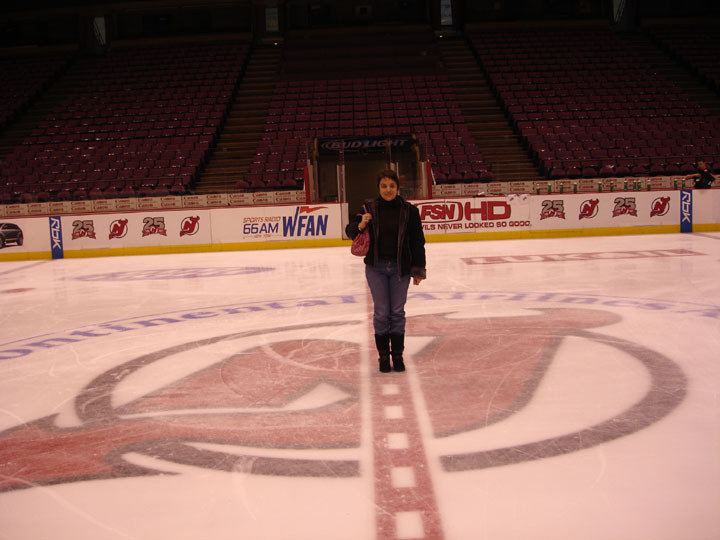 This entry was posted in For Readers and tagged A Perfect Distraction, Continental Airlines Arena, New Jersey Devils, research on July 26, 2013 by annasudgen. One of the most common questions writers get asked is where you get your ideas. The simple answer is from all sorts of places. Not very helpful or very interesting. So, for those of you who want interesting, here is the story behind A Perfect Distraction. In particular, its hero – Jake ‘Bad Boy’ Badoletti. By now, you know I’m a big hockey fan :). And I love romance novels. Combine the two and I’m in heaven.So, writing a hockey romance was an obvious step for me. But how to make it original? Well, I didn’t have to look very far – in fact, to my very own New Jersey Devils. Former captain, Scott Stevens, who was inducted into the Hockey Hall of Fame in 2007, was one of the all-time great defencemen. He led the Devils to three Stanley Cups, won the Conn Smyth trophy for playoff MVP in 2000, played in more regular season and post-season games than any other defenseman and was named to thirteen all-star teams. He was also the first New Jersey Devils player to be honoured by having his number retired. No-one will wear no. 4 for the Devils again. Scott’s reputation is legendary – hard-hitting, hard-playing. Check out videos of his top ten hits on You-Tube. This man has probably given more players concussion than anyone else on ice. (Sadly, it was a concussion that forced him to retire). But he didn’t take cheap shots. Scott was also a great leader and a great mentor; no-one played harder, with more commitment and intensity. Yet, Scott is a family man who adores his wife and children. Who supported his team-mates and friends off the ice quietly; without fanfare. He has the respect of all around him, both on and off the ice. A good friend, team-mate, family man – the epitome of a good man. Tell me the many facets of Scott Stevens – the ultimate bad boy, good man – don’t enthrall you? They inspired me to create Jake ‘Bad Boy’ Badoletti; a hero filled with similar contrasts to Scott. Jake plays hard, both on and off the ice. He is the ultimate bad boy, until a tragic accident changes him. Through the course of A Perfect Distraction, he learns that he is also a good man. Although Scott Stevens is the inspiration for A Perfect Distraction – remember, this book is a work of fiction! 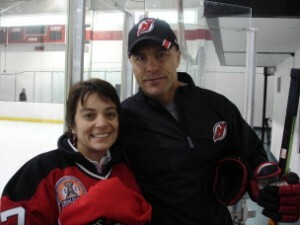 Imagine my thrill when, during the course of my research, I met Scott Stevens! There I was, soaking up the sights and sounds of a Devils’ practice, when a familiar figure skated onto the ice. A buzz went through the small crowd of spectators as we realised who it was. After practice, Scott graciously signed autographs and posed for this photo with me. Trust me, those piercing blue eyes are as arresting in person as they are in the clips! Now, there’s a real life hero. This entry was posted in For Readers and tagged A Perfect Distraction, Bad Boy, hero, hockey romance, Jake, New Jersey Devils, research, Scott Stevens on July 26, 2013 by annasudgen. I’ve been asked to provide links to two recent articles I wrote for Romance University, so here they are! The first article, entitled Surviving Nearly There, looks at how to get through what I think was the toughest part of my journey to publication. I provide some tips on things you might try – things I did! – to help keep going on the path towards achieving your dream. You can find Surviving Nearly There here. The second article, If At First, You Don’t Succeed …, looks at ways in which you can keep your faith, motivation and courage alive while on that often long and arduous journey to publication. You can find If At First, You Don’t Succeed … here. This entry was posted in For Writers and tagged articles, Romance University, writing journey on July 26, 2013 by annasudgen. Reading books, watching programmes and going to games is a great way to learn about players. You can also get a wealth of information listening to the commentators — especially when they’re as good as the Devils’ duo – Mike ‘Doc’ Emrick and Glenn ‘Chico’ Resch – and hockey expert Stan ‘The Maven’ Fischler. But, there’s nothing like talking to the real thing. And you don’t get any more real than Mr Devil himself, Ken ‘Dano’ Daneyko. That’s why it was an enormous thrill for me, when Devils’ owner Jeff Vanderbeek arranged for me to meet with Dano. Ken Daneyko was a gritty, physical defenseman, an almost impenetrable wall in front of the Devils’ goal. One of only a handful of Devils to be on all three Stanley Cup-winning teams, Ken won the Bill Masterson Trophy in 2000 for perseverance. No greater tribute could have been paid to Ken, than having his number 3 raised to the rafters. Only the second player in Devils’ history to receive that honour. 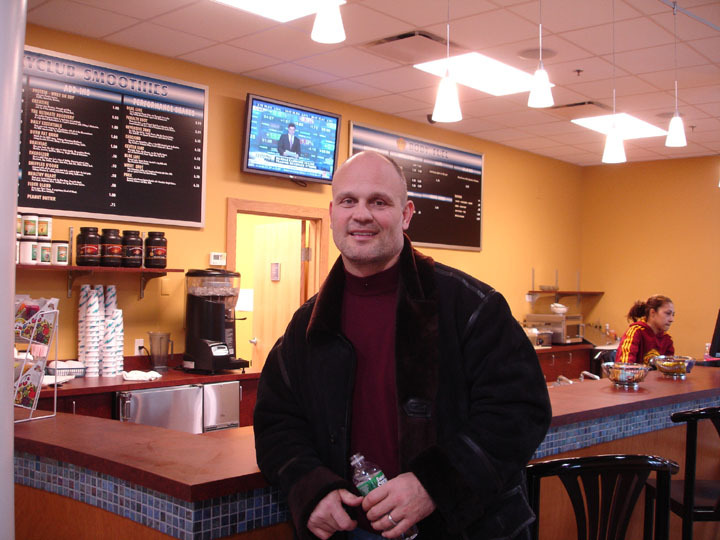 I met Ken at his gym in Hoboken — Sky Club. There he answered all my questions honestly, openly and with great humour. Whether it was about his pre-game routine, the way he explained his aggressive behaviour on the ice to his children, or how he felt when he stepped on the ice, Ken helped me to understand better what it was to be an NHL player; to live, breathe and bleed for hockey. As anyone who’s seen him on the television will tell you — he has a wealth of hockey stories to tell. After all, Ken began to play hockey at a time when goalies puffed on cigarettes between periods. And beer, not Gatorade, was the replenishment drink of choice. It’s these colourful tales that give a writer invaluable information. They help add depth to characters; sparking ideas for how to bring players to life on the page. They also add those elements of realism that a sports fan will notice and enjoy. My favourite story was about his teeth – or lack of :). For those who remember, fondly or otherwise, the Devils third Stanley Cup triumph in 2003, one of the most heart-warming images was of Ken — minus his front teeth – skating around with the ultimate hockey trophy raised above his head. Imagine how much fun it was to learn that his kids were so disappointed when, on retiring, he got his teeth fixed. Parties wouldn’t be fun anymore without Dad impressing their friends with his gap-toothed grin. Despite his punishing hits on the ice and his lively, unfettered behaviour off the ice, Ken is a charming, humble man, who is grateful for the opportunity he had to play the game he loved and get paid for it. That he was able to play it at the highest level, and win it’s greatest prize three times, is beyond compare. And the measure of the man is in how much he tries to give back — to the Devils’ organisation, the community and to hockey. I’m really grateful for the time he spent with me. A Perfect Distraction is a better book thanks to Ken’s help and information. This entry was posted in For Readers and tagged A Perfect Distraction, Ken Daneyko, Mr Devil, New Jersey Devils, research on July 25, 2013 by annasudgen. Baffled by the number of craft books out there? Bewildered by all the different workshops telling you how to write your book? Bothered that you’re doing it wrong? All You Need is a Six-Pack is an interactive workshop that will show you how to develop a writer’s tool kit that works for you, by looking at your writing process and your writing journey. All You Need is a Six-Pack has been given at several Romance Writers of America chapter meetings, including NJRW and BCRW, and at the Romance Writers of Australia conference. Articles on this topic, based on the workshop, have appeared in various RWA chapter and RWAus newsletters. Previous attendees have praised the workshop for giving them the confidence they need to grow and develop as writers. They said it enabled both beginners and inexperienced writers to focus on their own process, the tools that work for them and to think about the tools they might be missing. In addition, they were reassured that they are not alone in being overwhelmed by the wealth of information available or in lacking confidence that we’re ‘doing it right’! This entry was posted in For Writers and tagged All You Need is a Six-Pack, handouts, workshops on July 25, 2013 by annasudgen. As a veteran of numerous pitches to editors and agents, I’m often asked for advice on how to survive that all-important pitch session. Panic-Free Pitching is an interactive workshop that gives practical hints and tips, an invaluable list of dos and don’ts and all the necessary tools to make the most of your appointment. Based on the phrase ‘Preparation is the key’, the workshop covers Mental Preparation, Physical Preparation and Work Preparation. Panic-Free Pitching has been given at chapter meetings, the NJRW conference and the Romance Writers of Australia conference. Articles based on the workshop have also appeared in various chapter newsletters, including NTRWA. Many attendees have been delighted by the results; for a number, their post-workshop pitch was their first successful pitch, after several failures! This entry was posted in For Writers and tagged handouts, panic-free pitching, workshops on July 25, 2013 by annasudgen. RT excited about more Ice Cats’ books! 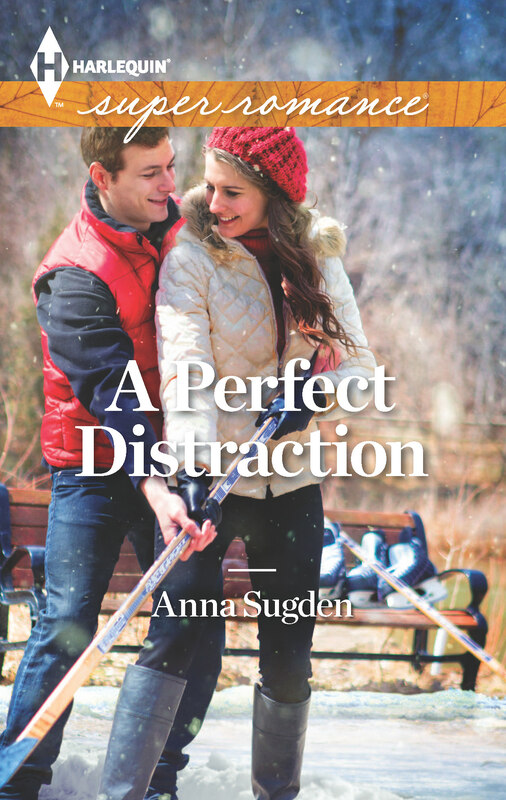 Anna Sugden is sure to delight sports romance fans with her dramatic and sizzling book,Rescuing Jenny, the story of a hockey fan and the player who betrayed her when they teens. As the two of them overcome their differences, they struggle to create a happy future together. This entry was posted in News and tagged Books, Harlequin Super Romance, Ice Cats, New Jersey Ice Cats series, Rescuing Jenny, RT book reviews on July 22, 2013 by annasudgen. One of the things that regular visitors to the old version of my website asked me to do, when I looked at revamping my site, was to keep the section – previously called Extras – that gave them insights into me and my books. Whether it was the pieces I wrote about the research I did for the New Jersey Ice Cats series, fun examples of Two Nations Divided (by a single language) or information on my shoes, cats, penguin collection, craft projects etc, they wanted to be able to visit and revisit. If there is anything you’d like to see here, please contact me. This entry was posted in For Readers and tagged cats, craft projects, extras, penguins, research, shoes, Two Nations Divided on July 11, 2013 by annasudgen. I’ve been asked if I could make the resources from my workshops available on my website. So, that’s what I’ll be doing on this page. I’ll also be including links to articles and blog posts on various For Writer topics. Feel free to download and use the materials posted here – I hope they are helpful. If you want to reproduce them, quote them or include them in your own workshops or articles, please contact me using the link on this website. Equally, if you would like to see information on a particular topic, you’d like me to give one of these workshops or write an article, please contact me. This entry was posted in For Writers and tagged articles, handouts, workshops on July 11, 2013 by annasudgen.